School Brochure can be downloaded here. Go to the ACFA Regional Fire School website. Sponsored by the Addison County Firefighter’s Association, Inc. It is with deep gratitude, a heavy heart, and great joy that the Addison County Firefighters Association, Training Committee dedicates the 2018 Addison County Regional Fire School that will be held on April 28-29, 2018 at the Vergennes Union High School to Chief Robert Jenkins of the Ferrisburgh Fire Department. Bob has received so many recognition awards including this one before. However it has been over two decades since the school was dedicated to him. That is four times the average years of service for a volunteer firefighter today. 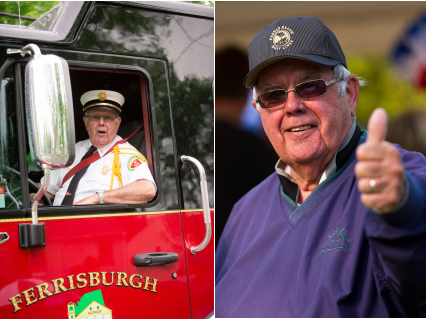 Bob did not just hold a place on the roster of the Vergennes Fire Department or the Ferrisburgh Fire Department for 56 years. Rather he led with a heart filled with passion, a mind that was always learning, and a spirit that was always teaching. His ability to quietly accomplish tasks behind the scene and his willingness to boldly proclaim his thoughts and challenge the status quo has shaped the lives of his family, countless firefighters, the communities he served, the fire service of Vermont and especially The Addison County Firefighters Association. As the sound of the final alarm bell fades, and Bob hears the words “well done good and faithful servant”, this regional school recognizes that because of Bob, we are a better people, the world is a better place, and the life of Bob Jenkins will live eternally in the accomplishments of the countless people he led.